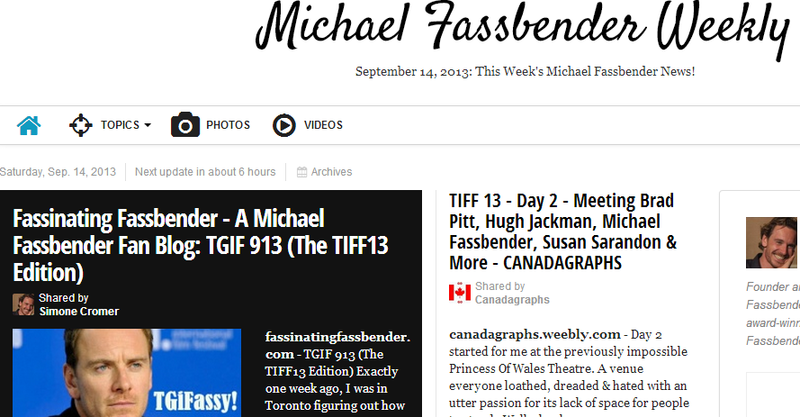 Fassinating Fassbender - A Michael Fassbender Fan Blog: Michael Fassbender Weekly is now LIVE! 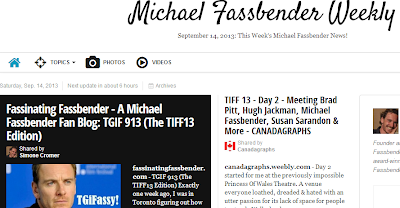 Michael Fassbender Weekly is now LIVE! Did you read the newsletter this morning? This will be an online newspaper that captures the highlights of Michael Fassbender news in one place. Fassinating Fassbender just keeps expanding and expanding. Enjoy! Screen shot of draft version of new online paper. Wow Simone, this is fun! I have taken a quick glimpse on it and I like it so far. And thanks again for all the effort you put in to professionalise fassinating fassbender. FF transcends a regular fan blog! You've done it again Simone. Very sleek and nice look, can't wait to read more. Thanks ladies! It's still a work in progress, and if I want more tools and access/control of it, I need to go pro. I'll see how it goes over the next month or so and determine if I'll go pro. But for the time being, I'm still learning the ropes there and I'm cussing the template out already cuz some edits aren't sticking. But, it's ok, and I'm glad you guys like it thus far.